A collection of vegan recipes using okara, the pulpy byproduct of the soymilk- and tofu-making process. 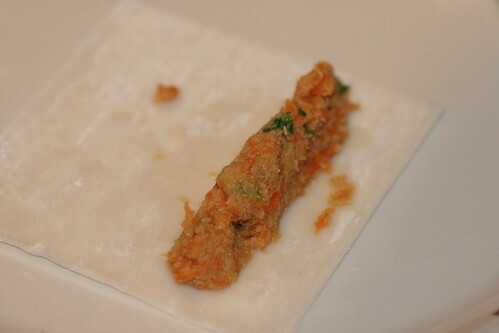 Today we're revisiting the fried okara spring rolls, only this time we're making them with egg roll wrappers. It took me forever to find egg roll wrappers that were vegan! 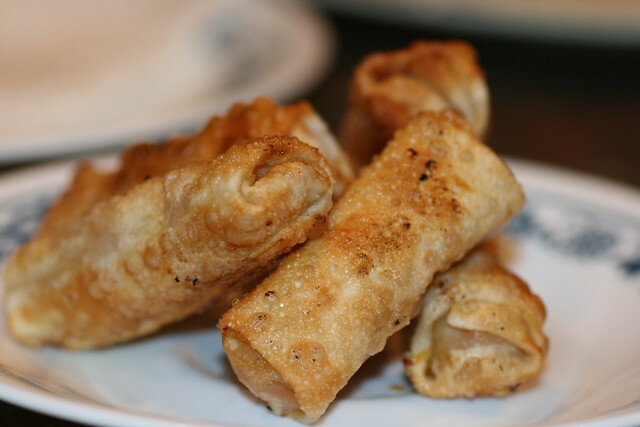 In my opinion, spring rolls just aren't meant to be fried, and this tastes much better with the egg roll wrappers. and stir for several minutes, until the liquids have been mostly evaporated and the contents have been thoroughly combined. give or take, depending on the size of the carrot you used. 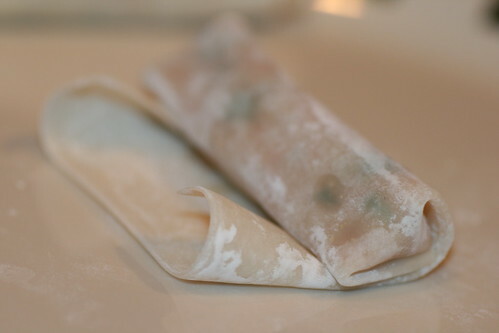 Put a half Tablespoon of the okara mixture into the egg roll wrapper. Place it on one side of the wrapper and leave enough space to fold down the tops and bottoms. Obtain a small cup of water to dip your fingertips into. 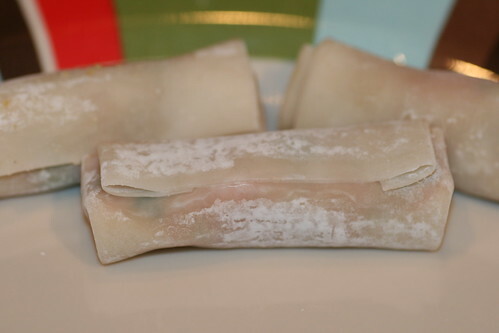 Moisten the top and bottom of the wrapper, and then fold over the top and bottom of the okara filling. Roll the wrapper over the filling. When you have a little flap of wrapper left, moisten it and stick it to the rest of the wrapper, sealing it. I used canola oil but something like sesame oil might be more appropriate for a dish like this. If the oil is deep enough to submerge the rolls, fry them until they turn a golden brown. If the oil is too shallow for full submersion, make sure you flip the rolls to ensure even browning. Remove from oil and drain on a paper towel. Verdict: Much better with the egg roll wrappers! I love the taste, and thought they were fine without any dipping sauce. 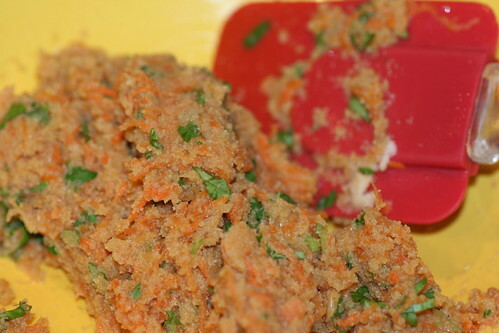 can you tell me if okara sticks to make croquettes and bread with out gluten? Hi Irene, I don't do gluten-free cooking, but I would assume the flour-containing recipes would work OK with some kind of gluten-free flour substitute. I can't vouch for it, though. If there are instincts needed to convert to gluten-free cooking, I don't have them. Luckily for me, I'm not allergic to gluten so it's not something I avoid. I stumbled on your blog while searching what to do with my okara. This is an awesome idea! Really looking forward to try some of your recipes. I just discovered your blog. My new soymilk maker is arriving tomorrow and I'm looking for ways to use the okara. Your recipes look wonderful. I hope you're planning to continue blogging. 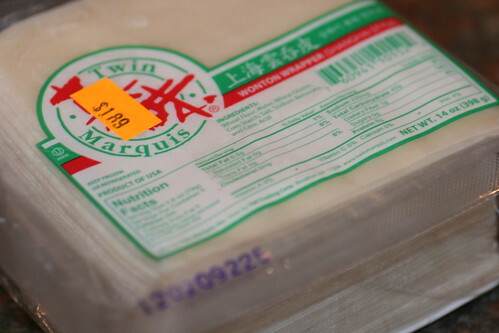 Unless otherwise noted, I use "wet" okara when cooking; i.e., straight from the soymilk-making process, well drained but without additional squeezing or drying. Since there is variation in okara in terms of wetness, your mileage may vary when following these recipes. Let me know how they turn out for you! If you don't have access to okara, it might be possible to substitute pureed tofu. I haven't tested these recipes using that substitution, but some of the muffin recipes (e.g., corn muffins and banana-nut muffins) were modified from recipes that originally used pureed tofu. Unless otherwise stated, all photos and recipes copyright to the Okara Project (to the extent that they can be copyrighted). I started making my own soymilk to save money and cut down on waste ... only to discover that I was producing more okara than I could shake a stick at. Hence, this recipe blog. Other than good vegan food, I love reading, writing, independent music, science, evidence-based medicine, and quality television.